Are you looking for a mobile coffee bar? At Tom’s Coffee mobile coffee bars are our speciality. 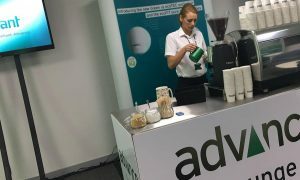 We add value to our client’s businesses by providing fully branded coffee bars to exhibitions, conferences, weddings, film shoots, roadshows and various types of functions. Our mobile coffee bars come branded with a three sided counter with your logo on. We can also brand cups, aprons, napkins – in fact anything you want! Distance is no object to us. We are based in the beautiful spa town of Harrogate but regularly travel all over the UK and Europe with our mobile coffee bars attending events and exhibitions on behalf of our clients. Our goal is to provide an incredible experience for your delegates by creating delicious coffee that any connoisseur would be proud of. Our baristas are highly trained professionals who have the knowledge to extract the coffee in the correct way to make beautiful lattes, flat whites etc using textured milk to draw hearts and rosettas into your drinks to create the wow factor from you mobile coffee bar. Our mobile coffee bars are fully self sufficient with on board water tanks, electrics and waste. All we need is a power supply. Our coffee is hand picked from the best beans we can source. It varies month to month as we are always aiming for the next best roast. Existing clients include, property development companies, house builders and commercial landlords, Agricultural crop production specialists, technology companies, fuel companies amongst many others. Hiring a mobile coffee bar and baristas is great for generating new leads and contacts over a hand crafted cup of coffee, whilst offering great hospitality that your clients will remember, whilst reflecting your company’s brand and values. We have been in business for over 10 years and as such have developed great systems and practices whilst also attracting great staff members to operate your mobile coffee bar so rest assured you are dealing with a professional and reliable company. We regularly work with some of the largest branding agencies and blue chip companies at conferences and exhibitions creating incredible stands with a bespoke coffee offering. We can supply references on request from many of our delighted clients! Please contact Tom’s Coffee today on 03333 444917 where one of our friendly team can help plan your next event. Mobile barista service and event catering, serving corporate, sporting and social events throughout the UK and Europe for over a decade. Our aim is to give our clients 100% satisfaction by being the best we can be. The best coffee, the best service and the best experience.